After entering only a week before the race, Tim Freriks surprised many by winning this year’s Transvulcania Ultramarathon. In the following (windy) interview, Tim talks about how he decided to race Transvulcania at the last minute, who he trains with, how he managed to win the race, and what comes next. Be sure to check out our results article for the full race story. iRunFar: Mauri Pagliacci of iRunFar, and I am here outside of the airport at La Palma with Tim Freriks, the 2017 Transvulcania Champion. Congratulations, man! Tim Freriks: Thanks, man. Yeah, it was an exciting day. It couldn’t have gone better. iRunFar: I was a couple days before on the island here. You were kind of the dark horse. How was it? How did it happen? At the start you just jumped out? Freriks: Yeah, it was great. The whole trip was kind of an idea thrown around by my friend Jim Walmsley. Yeah, he kind of tossed the idea out to me less than two weeks ago. I just didn’t think it would be possible at first, but we made it happen. We got out here late on Thursday, and then I was kind of just in sleep and relax mode. I didn’t get to see a whole lot of the island, unfortunately, but 45 miles worth was good. 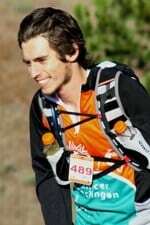 iRunFar: What did you think of the race in general—the course, the ambiance? Freriks: It was incredible. There are a few events in the United States that have big crowds, but this was just insane. The crowds are just so into it. All the toughest parts there were people lining the course just going crazy. The course was beautiful, too. I think it played too my strong suits with all the climbing, and that type of terrain, I usually run pretty well on. iRunFar: You’ve had some sidekicks for training with Jim? Freriks: Yeah, I’ve been training with Jim and Cody Reed—those are the main two. Then every once in awhile we’ll get, like Hayden [Hawks] came by a couple weeks ago and was training with us. Yeah, between those two guys and anyone else who’s coming through town… we’ve got a lot of road and track guys that we get out with. iRunFar: Tell me a little bit about the race with Hayden. I was out at the 23k mark, and it looked like you were working together. Freriks: Yeah, we both said we were feeling pretty comfortable early on. It felt comfortable. It felt good. But we were kind of just pulling away from everyone, so we decided we were going to work together. We stuck together the first half. That couldn’t have gone better. It was great to have each other to key off of and push each other. I know in the past there have been Americans that have taken it out, but they’re alone. That’s a tough way to run. Yeah, running with Hayden couldn’t have worked out better. iRunFar: You nailed the downhill really well. How was it? The race has been won in the downhill. What you said about the other Americans like Sage [Canaday] or Zach [Miller] had good races, but you nailed the downhill. How did you feel about your down? Were you scared at some point of losing? Freriks: Yeah, totally. The downhill was actually what I was most worried about. I know I can climb. I run in the Grand Canyon a lot—which has descending also—but I don’t think I’m quite as strong on the descent. I’ve been hearing through the grapevine that some of these guys can really descend. So I was running scared on the downhill, and I think that helped a lot. I think Ludovic [Pommeret] was even closing on me on the downhill. I kind of goofed around in a few aid stations on the downhill making sure I was taking care of myself. Yeah, working the downhills worked out. iRunFar: What’s next for you now? This is a big jump. Is it sinking in? Freriks: Yeah, this was such short… we planned this out so quickly. I really don’t know what’s next. iRunFar: You just slapped for it? Freriks: Yeah, originally I was planning on Broken Arrow in California. I might still do that. I haven’t been racing very often recently. That feels like a quick turnaround for me right now. I don’t know. Depending on how things turn around for me after here, I might hop in that. I’m pacing Jim at Western States. That’s the plan anyway. Freriks: I need to be at 40% of his fitness to run 40 miles. Even that’s a tall order. I’m looking forward to that. I think that will be fun. iRunFar: Congratualtions. I know you have a flight to catch. Thank you so much for your time. Congratulations. Enjoy letting it sink in. Safe trip. Freriks: Thank you, I appreciate it. Thank you. It seems Tim run Transvulcania in road shoes. Anybody knows which ones? Thanks. Looks like the adidas Boston Boost: http://www.startfitness.co.uk/search/adidas-boston-boost.html . I think someone confirmed that during the coverage. Thanks. Then same as Walmsley at WS last year. I wonder if it says something about trail shoes in courses that aren’t too slippery or badly in need of underfoot protection. Didn’t you run HR in marathon flats? Some of my most enjoyable trail runs were on a cheap pair of Asics trainers. Cushioned, supportive, and smooth over runnable terrain. I’ve run the past two Hardrocks in New Balance 1400s with a forefoot rockplate slide under the insole. Most of my trail running is in the 1400s without the rockplate. I haven’t tried the 1400s, but I’ve only heard good things about those shoes. It shouldn’t take long for Freriks to land a shoe sponsor, though. The dude seems super talented. It would have been a good duel with Luis Alberto. Too bad Sage wasn’t there either. Anyway, there’s always UTMB. So much talent there this year, the world might implode. It’s gonna be awesome. David and Megan Roche won Way Too Cool 2016 in LunaRacers and Pegasus, respectively. Not a very technical course when dry, but it was a frickin’ mud bath that year. Rob Krar did pretty much everything in LunaRacers when he was in his prime. There are some trail shoes I’ve loved, but I’m really not convinced of their superiority over good road shoes on the vast majority of terrain. 2m41s faster than Luis’ win last year.